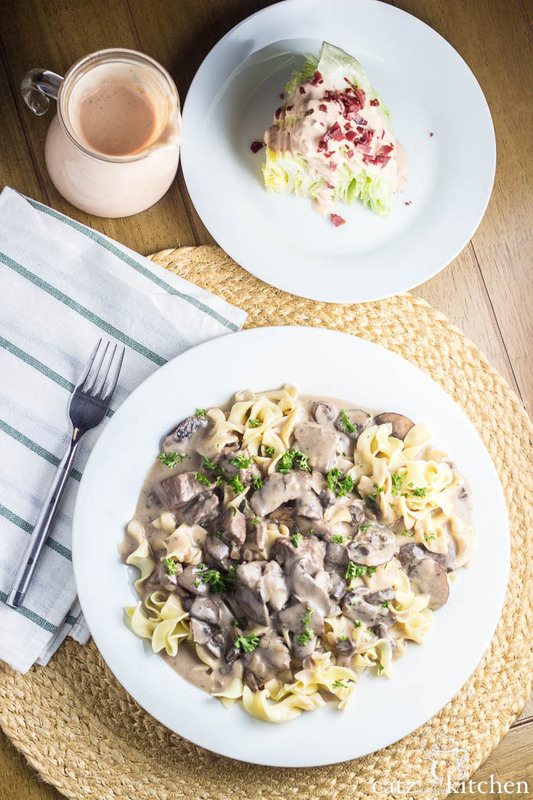 One of my Josh’s favorite dinners is stroganoff. But I never, ever make it! I’ve tried a few crockpot chicken versions before, but I’ve never really enjoyed them. They always tasted a little meh to me. 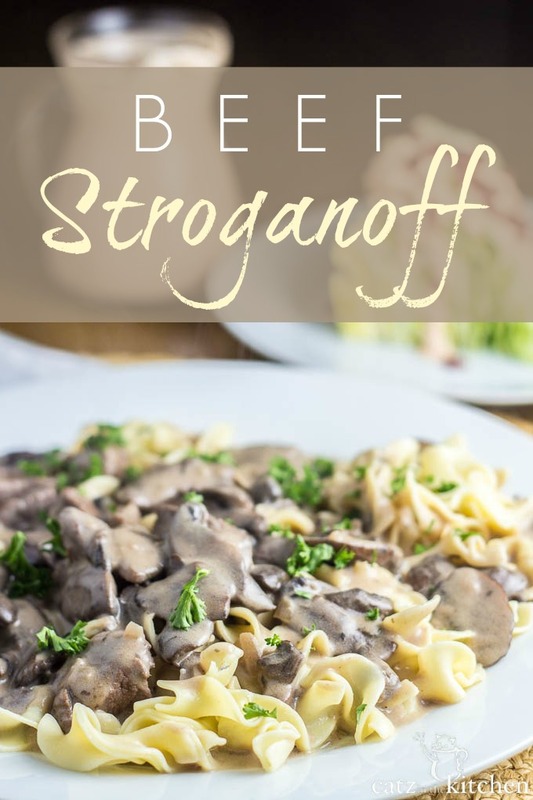 I never even attempted a beef stroganoff because there were always mushrooms in the recipe and for the longest time, we didn’t like mushrooms. But…now we do, and a whole new world of recipes opened up to us because of that! I picked up this recipe at my last homemaking & hospitality class, and I’m so glad we made this, because it is out of this world amazing! Throughout the entire meal at my class, we were all dying over how good everything smelled. And I, being the genius that I am, had an appointment earlier in the day and never really got around to eating lunch. Needless to say, by the time I showed up for the class, I was starving. This dinner was worth the wait, though. One bite into it and I knew that this was the meal I was going to make for my family’s Valentine’s Day dinner. Every year, I always choose a meal I deem fancy, and Josh and I usually get into the kitchen together to prepare it. I just knew he was going to flip out for this one. He did! In fact, he and the kids did. Everyone had seconds, which meant there was only a tiny bit left for leftovers-which I can honestly tell you, reheated deliciously. This is just one of those meals that, while extremely easy to prepare, looks and tastes so fancy that you’ll have everyone believing you spent hours slaving away over it. But you didn’t. I have a feeling I’ll be getting requests to make this again very shortly. 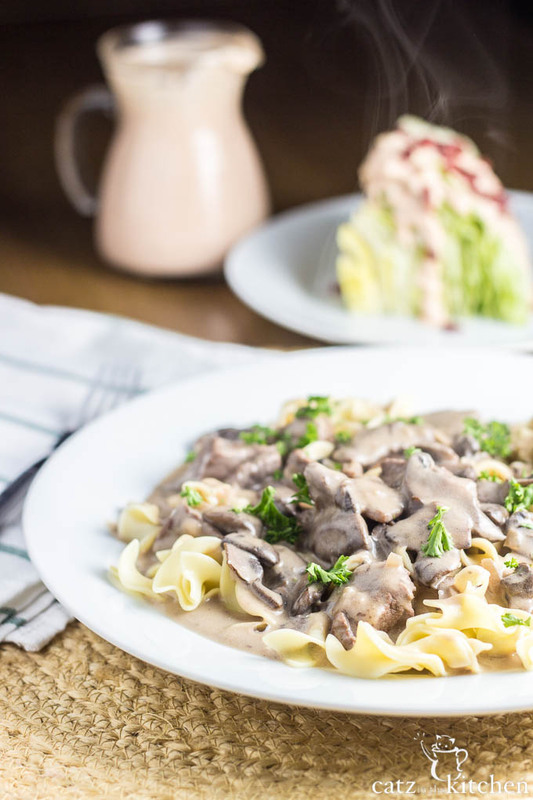 Ready in under 45 minutes, this rich and creamy recipe for beef stroganoff is sure to make mushroom lovers out of your entire family. Prepare noodles. Drain and set aside. 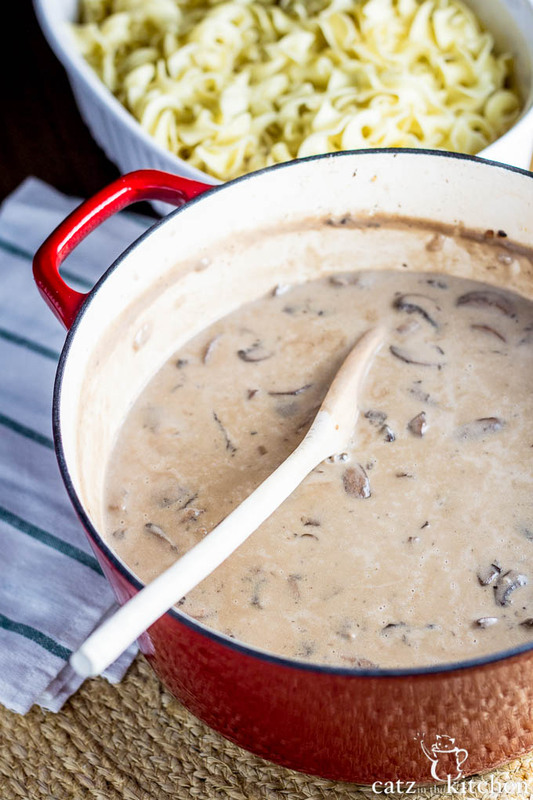 In the same pot used for cooking the steak, sauté the mushrooms and shallot over medium - low, until the mushrooms and have cooked down and release some of their moisture. Add the bouillon, wine, cream, and 1/2 cup flour. Stir until slightly thickened and the flour has been incorporated. Add mustard, Worcestershire sauce, and sour cream. Add the beef and garlic and bring to a simmer. 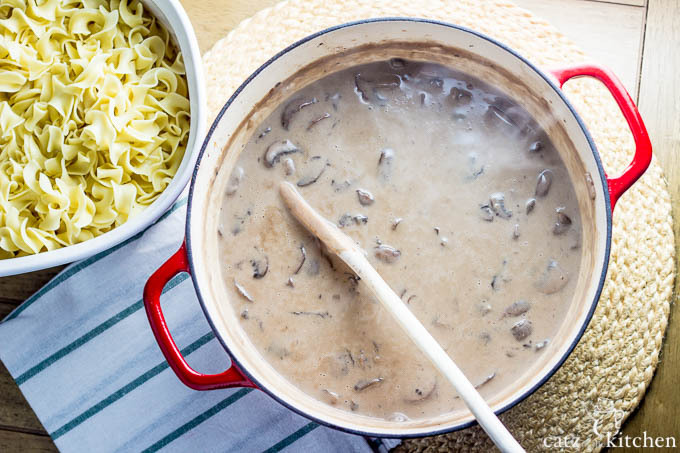 When sauce is simmering, bring the temperature down to low and allow the flavors to simmer together for 10-15 minutes. Remove from heat and allow to stand for a few minutes. The sauce will thicken even more as it stands. 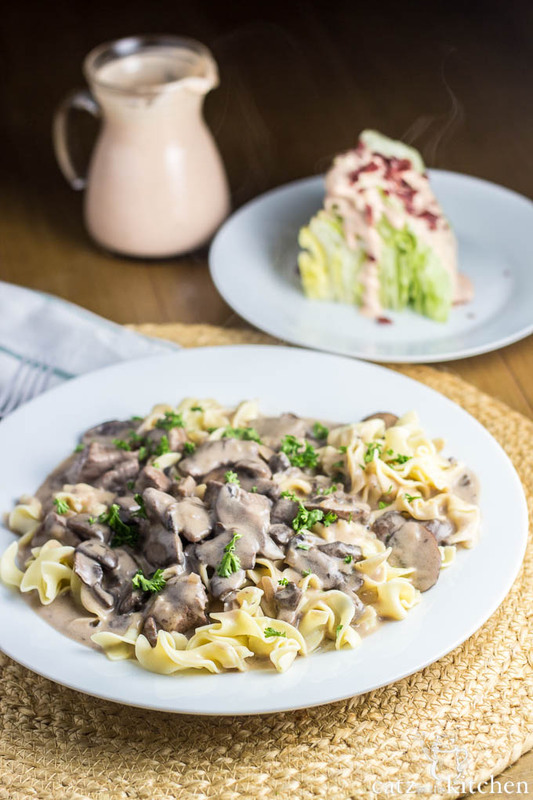 Serve the egg noodles and pour the beef stroganoff over the noodles. Top with additional sour cream if you like. Hello! This looks wonderful, however I am not a fan (nor is my family) of using wine in meals. It's not a matter of the alcohol, as I know that cooks out. It is the taste or flavor it adds that we don't care for. Is there something I could substitute for the wine in this recipe? Thanks! Hi Yvonne, if you don't like the flavor of wine in your food, you could just increase the beef stock used instead. It will give it a meatier flavor which would be really nice. :) I hope that helps.